Considered by many to be the ‘Master’ of ivory sculpture, Ferdinand Preiss was a skilled designer, modeller and carver, who worked throughout the Art Deco period. Well known for creating intricate Chryselephantine statuettes, his work was the epitome of Art Deco style. Taking inspiration from the female form and the celebration of women’s new-found freedom, Ferdinand carved stylised and lavish statuettes of elegant women enjoying the new jazz age. His innovative, unique style has since been rewarded by commanding thousands of pounds at auction, thus securing Ferdinand Preiss’s place as one of our most celebrated artists of the 20th Century. 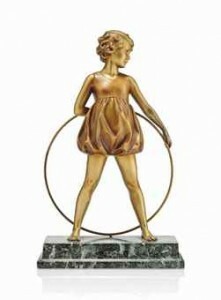 Pictured left: Ferdinand Preiss ‘Beach Ball Girl’ sold at Christies, April 2014, London for £28,750. Image Copyright Christies. Johann Philipp Ferdinand Preiss was born on 13th February 1882, in Erback (Oderwald), Germany. His father owned and ran the Preiss hotel, and his mother came from a traditional ivory carving family. Sadly, when Ferdinand was just 15, his father died and shortly after so did his mother, leaving him and his five brothers and sisters to be dispersed amongst relatives and friends. Ferdinand was sent to live with the family of Philipp Willmann, who was a successful master ivory carver. After completing an apprenticeship Ferdinand joined Willman’s studio where he remained until 1901. He then spent the next few years travelling and learning the skill of modelling before returning to Germany in 1905 when he took employment with Carl Haebler. Pictured right: ‘ Hoop Girl’, A Cold-Painted Spelter Figure After a Model by Ferdinand Preiss (1882-1943) sold at Christies, February 2014, London for £1,125. Image Copyright Christies. It was whilst working for Carl Haebler that Ferdinand met co-worker Arthur Kassler. Two like-minded individuals, they made the decision to leave and set up their own company. The Preiss-Kassler Foundry was established in 1906 and the two men worked as turners and carvers in ivory. However, Kassler was the one with the business acumen and tended to concentrate on the commercial side, whilst Ferdinand Preiss was the artist. The majority of Preiss’s figures were created using ‘Chryselephantine’ (a term used to describe the combination of various materials such as gold, tortoiseshell, silver, ivory or bronze); in the case of Preiss he used a combination of bronze and ivory to sculpt his statuettes. His earlier pieces were heavily inspired by Grecian figures with ‘The Archer’ being a strong example of this, but strangely his earliest recorded composition figure was actually carved from three different woods and is known as ‘Phryne’. By 1914 Preiss’s work had become so popular that the foundry had to employ a further six designers to keep up with demand and this success continued until the outbreak of World War I when they had to halt production. Business was resumed as normal in 1919, and this was when demand for Preiss’s stylised statuettes in human form went through the roof, causing them to become a phenomenal success. Concentrating on specialised Art Deco cabinet sculptures, these pieces were mounted on Brazilian onyx plinths, which were at times decorated with black bands of Belgium slate. Expensive yet desirable, the surge in demand for these stylised sculptors meant that the ‘PK’ factory had to expand its workforce, so by the middle of the 1920s ten designers were employed to work at the foundry alongside Preiss. During his reign, Preiss produced a whole host of different figural statuettes which included classical ivory nudes, bronze and ivory children, Olympians and historical figures. However he is probably most famed for his series of cold-painted bronze dancer figures which include ‘Charleston Dancer’, ‘Butterfly Dancers’ (which recently sold at Bonhams for £25,000), ‘Flame Leaper’ and ‘Con Brio’. Preiss’s fascination for contemporary dance is evident in these stunning life-like statuettes; each is so elegant and graceful that it’s easy to believe the beautiful woman is actually dancing before your eyes. 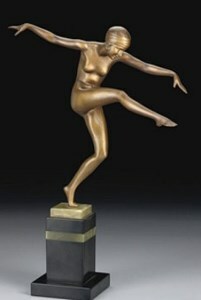 Another favourite theme to Preiss’s statuettes was to depict recreations such as sports, because it was important during the Art Deco period to “Live Life to the Full and Have Fun doing it!” ‘Girl Tennis Player’ and ‘The Golfer’ are just two examples of Preiss recreating these modern activities into his lavishly sculpted statuettes. As his popularity grew it became evident that demand for Preiss’s work was mainly in the UK, so Kassler and Preiss decided to take advantage of the export market and ship these stunning statuettes to both England and the United States. This explains why today many pieces find their way into major UK auction houses. Mark Oliver, Head of Decorative Arts at London’s Bonhams Saleroom, explained how there is intense competition amongst the auction houses at the moment to secure good examples of Ferdinand Preiss’s work. “Prices are rising rapidly as some very wealthy Russian collectors have entered the market. There is, however, strong competition from the US and UK collectors as each are looking for the rare studies such as ‘The Bathers’ where only three examples have appeared at auction in the last fifteen years.” Mark also told me that, “Competition is intense for examples that are in top condition, especially if there is no damage or hairlines to the ivory which is a common problem.” So, as Mark points out, if you only have £1,500 to spend then you have all but been priced out of the market as the top end determined buyers think nothing of spending in excess of £20,000 if it gets them the piece they want. Sadly Ferdinand Preiss passed away from a brain tumour in 1943, at the age of 61. The factory also closed that same year and the workshop in Ritterstrabe, which was stocked full of samples, was completely burned down when hit by a bomb just before the end of World War II in 1945. Ferdinand Preiss had an aptitude for recreating the beautiful female form into lavish luxurious statuettes. A gifted designer and sculptor, his distinctive style has captured the hearts of collectors worldwide, not only because they epitomise the frivolous Art Deco era which is still highly regarded but also because his work was ‘quality’ craftsmanship at its best. The quality of carving is a hallmark of Preiss’s work. Always be wary of poorly detailed carving. Some fakes are being carved in the Far East using poor quality ivory which the Preiss workshop would never have used. His bases were often very simplistic, so do not purchase anything where the base is ‘over-the-top elaborate’. Be suspicious of any Preiss work being offered at a bargain price. As discussed in the article there is great demand for his work and any genuine study is likely to be priced above the £10,000 mark, usually into £25,000 plus. Always take expert advice as to whether the onyx or marble base is a correct match. A broken base could be replaced at a later day with a ‘marriage’ and the Preiss signature added with an engraving tool. The RMS Titanic left Southampton on the 10th April 1912 headed for New York.